Free Local Delivery for Orders Over $49! We don't think Thanksgiving should come only once a year, so we created this meal for your cat to enjoy all year round. We don't think Thanksgiving should come only once a year, so we created this meal for your cat to enjoy all year round. The mouth-watering shredded Thanksgiving Day Dinner™ recipe starts with deboned turkey, then piles on sweet potatoes, carrots, peas, and cranberries for a delicious meal year-round. 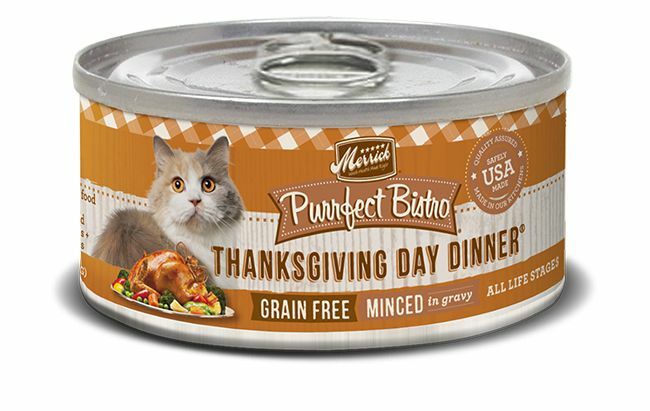 Purrfect Bistro Thanksgiving Day Dinner™ Canned Cat Food contains no artificial colors, flavors or preservatives. Not all brands make their own food. We put cooking and quality under one roof. Our five-star kitchen and manufacturing facilities uphold the strict guidelines well defined by the FDA. All of our Merrick recipes use farm fresh ingredients to ensure the highest quality. As a result, our recipes are 100% free of ingredients from China. Deboned Turkey, Turkey Broth, Deboned Chicken, Deboned Duck, Chicken Liver, Peas, Dried Egg Product, Natural Flavor, Dried Potato, Sweet Potato, Carrots, Cranberries, Organic Alfalfa, Calcium Carbonate, Salt, Potassium Chloride, Carrageenan, Cassia Gum, Guar Gum, Powdered Cellulose, Sodium Phosphate, Salmon Oil, Minerals (Zinc Amino Acid Complex, Iron Amino Acid Complex, Manganese Amino Acid Complex, Copper Amino Acid Complex, Potassium Iodide, Cobalt Glucoheptonate, Sodium Selenite). Vitamins (Vitamin E Supplement, Vitamin B12 Supplement, d-Calcium Pantothenate, Vitamin A Supplement, Niacin, Vitamin D3 Supplement, Riboavin Supplement, Pyridoxine Hydrochloride, Folic Acid, Biotin, Thiamine Mononitrate), Taurine, Choline Chloride, Thyme, Sage, Rosemary, Yucca Schidigera Extract.